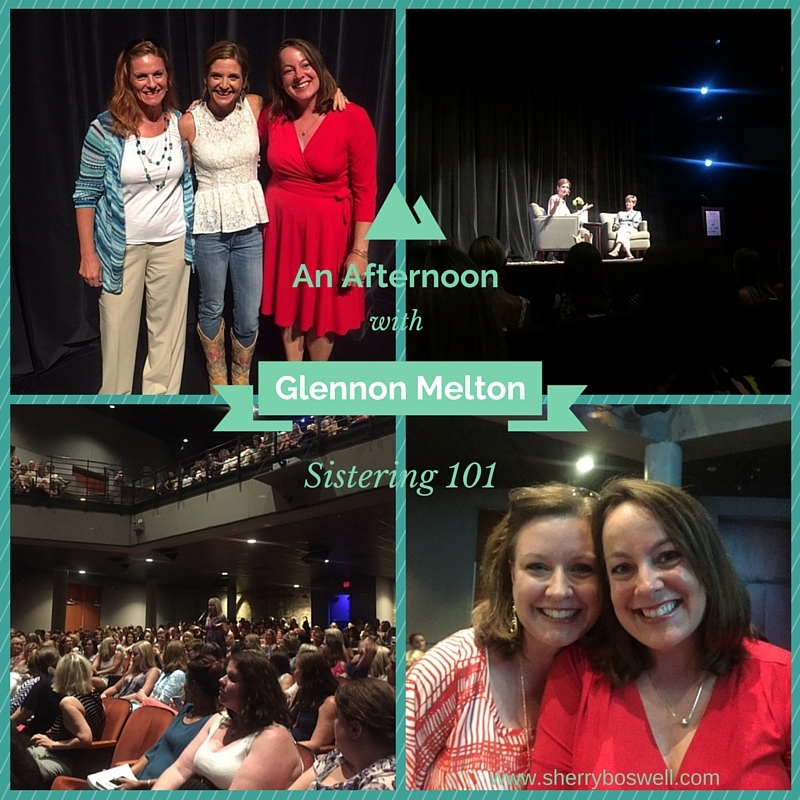 In case you missed the first post of my trip to Charleston to hear Glennon Melton speak, you can read that HERE. If you already read it, then welcome back! Here is the continuation of the 25 Things (takeaways if you will) from hear the fabulous Mrs. Melton’s talk. This was part of the Glennon’s response on how she got started blogging. She went all the way back to when she went to AA (Alcholics Anonymous) with her sister, whom she affectionately refers to as her Left Lung. Her sister said to her she wasn’t sure if AA was going to be enough, she may need more like Triple A. And they laughed together. We all have things that break our hearts and motivate us to DO SOMETHING. For my best friend Suzanne, it’s animal cruelty and foreign adoption. Meanwhile, Donna runs and carried the torch for Special Olympics; Faith mentors a young girl who also faces life with her lucky fin as a result of ABS (Amniotic Band Syndrome); Ashlee and her husband work with Young Life. Whatever breaks your heart is the catalyst for who you need to serve. 17. Parenting is like being a dormant volcano. You know, I’ve never thought of it this way, but somehow Glennon’s analogy of being a dormant volcano when parenting makes sense. She’s sitting in the park chatting with another mom, who asks the innocent question, I feel Like a dormant volcano all day. Talk about bringing a play date to a screeching halt! But I understand this, especially after last night when both my kids tested me in different but equally trying way. When it happens on the same night, you are convinced they are in cahoots and trying to drive you to the brink! So my teen daughter gets a really bad grade on a test, and I’m like, “You can do better. This is not acceptable.” She would say the dormant volcano just erupted. In truth, I really didn’t go off–but inside I was simmering and oozing with hot lava. But it was important for her to go to bed knowing she doesn’t have to make all A’s or that I expect that of her. I heard myself telling her what matters is that she has character, integrity and is kind, brave and walks the walk as a Christian. I told her I’m proud of her and pointed out how independent and responsible she has been about her assignments and how I don’t have to hover over her to make sure her work is done. But that I am here to help. She went to sleep knowing these things and I somehow pulled all that out of my you-know-where and the volcano went back to sleep, too. 18. People aren’t doing things AT YOU. But boy, it can feel like that. So Glennon shares this story of how she managed to get all 3 of her munchkins out the door and took them to the food court. She’s having a good day and the kids are looking around like they are at Disneyland because they’ve never been to the food court. Glennon is proud in her accomplishment because she has gotten the better of her anxiety. And then up walks another mom with her daughter with two braids. Not just one. But TWO. This is noteworthy because Glennon often can’t even get a brush through her girls’ hair, let alon a braid. The mom sits down at the table right next to them and then starts pulling something out of her bag. It’s …. an avocado. She feeds this avocado to her daughter like a mama bird would to its baby bird. And Glennon has to call her husband because it’s all too much. She says to him, “This mom is parenting AT ME.” And he replies with the technique they have learned in therapy, “OK, I hear what you are saying…” and repeats it back. Then asks her to consider if there is any universe where she can consider the fact that this mom had no idea Glennon would be in the food court that day. Silence. The realization hits: this mom is not parenting AT ME. No one is doing anything AT ME. People who have different beliefs or politics are not doing it AT ME. It can feel like that sometimes, but we are all just trying to do the best we can. The struggle is REAL on this one. 19. The broken-hearted are doing world-changing things. You’ve heard this one before, perhaps even uttered it yourself: “I can’t do that, it will break my heart.” That cause or organization is just too raw, too hard, too much. Yet Glennon has noticed that most of the people who are doing these world changing things have one thing in common: “all their work began with a broken heart.” Think about it–they are driven to do great things because of their brokenness and sadness and grief. It gives meaning and purpose and fills a void that can never be filled again. I especially see this when parents who have lost a child become advocates for fighting pediatric cancer or not texting and driving or anything else that took their beloved away. 20. There are toxins in the air all around us, and we are all affected by them. Glennon has said in interviews that she considers herself “super sensitive”. She likens that to the canaries that coal miners take down into the mines to determine if it’s still safe for them to be down there. If the canary is still singing, then no problem. But if it stops singing or even stops moving, well then, it’s time to get out of there! She acknowledges that her anxiety, depression, addiction almost killed her but also calls them her “superpowers”. Now she has changed her outlook on it: she believes that more of us are affected by the toxins in the air than we even know. We all have sensitivities to the toxins of hate, fear, racism, bigotry, etc. 21. When there aren’t any words, find a way to say something. Have you seen this before: sometimes when people hit rock bottom or lose it all, they may also lose their friends. Why is that? Glennon suggests that it’s not because these friends aren’t good people or didn’t love their friend. Rather, they just didn’t know what to say to fix it. We need to not be so obsessed with fixing it and simply be there for our friend. Glennon suggested, “All that helps is saying, ‘I see your pain and it’s real and I’m honored if you’ll let me sit here with you.'”. 22. A funny thing happens when you open the floor up to Q&A. People share their stories too and it becomes a magical moment. A woman who is a professor at College of Charleston came forward and shared how things are in Charleston for her as a black female after the shootings. After she shared her struggles and her determination to stay and be part of progress, she got a standing ovation. Glennon jumped down from the stage and ran to give her a hug. The sense of community and sistering in the room was palpable. 23. Glennon just gets it. She met and posed for photos with hundred of women that lined up after the event. Even when she wasn’t told beforehand there would be a VIP after party and she had to get to the airport, she still made time to stop by and give more hugs and speak to everyone. Class act! 24. My friend and I met Glennon’s parents afterwards, and she comes from good stock. Bubba and Tisha are charming, friendly and so proud of both their daughters. They drove down from Virginia to hear Glennon speak, then were headed down to Florida to stay with Glennon and see the grandkids. Just talking with them for a few minutes, I got the sense that they were the foundation that helped cement their girls’ success. 25. If you follow Momastery or Glennon or have read her book, you should move heaven and earth to go hear her speak. That goes DOUBLE for people who don’t know her.